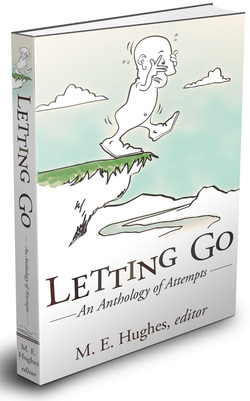 Letting Go: An Anthology of Attempts is a fascinating collection of life stories by 30 authors from seven countries. They write of their attempts to let go of everything from crippling grief and abusive boyfriends to dead husbands, fear of horses, old family homes, and piles of books and old papers. M.E. Hughes has guided and edited a small army of writers since receiving her MFA in creative writing from Bennington College. In 1991, she founded the non-profit Peripatetic Writing Workshop, Inc. (www.peripateticwritingandart.org). She has taught creative writing at New York University for many years and is also a free-lance book doctor/editor. She has published two nonfiction books and the novel, Precious In HIs Sight (Viking Penguin). Letting Go now available in eBook. "The wisely selected stories in this collection brilliantly exemplify the many complexities and interpretations of 'letting go' in ways that are profound, emotionally wrenching and sometimes even humorous. There are lessons for living here based upon the revelations of these writers who have the courage to be honest, authentic and vulnerable. I came away from reading this book feeling less lonely because of the realization that we all share the same desire for love and connection and that are ability to persevere under difficult circumstances is our greatest source of strength." ﻿It’s a fact: People hoard things from the past. Hoarded items are not puzzling specimens from Mars but recognizable artefacts of tiny civilizations known as families. Take a child’s rocking chair passed from generation to generation, preserved at Grandma’s house for the latest grandchild to use on sunny Sunday afternoons. At day’s end when the grandchild goes home, the little chair is put away till next time. Grandma eventually dies, and her children fight over custody of the tiny rocker. Finally, the loudest and orneriest wins out, and the chair continues its slow passage into the future as a thing that must not be destroyed. Into the winning sibling’s attic it goes, occasionally re-discovered and brought down for the latest family newcomer to try out. But the chair tips over, cracking the child’s head on the hardwood floor. My god! It’s the twenty-first century; that chair is abusive to children. Back into the attic is goes. When I was growing up, there was always an antique pottery jar filled with wooden spoons sitting on the counter beside the stove. When at last I owned my own kitchen and my own French country tiled counter, I searched for months, combing antique shops, for just the right pottery jar for my wooden spoons. Nothing new would do. Nothing from Pottery Barn or Williams Sonoma could ever fill my need for a used, grey or dark brown, preferably with a chipped rim, kitchen spoon jar, the kind a person in “olden times” might have stored flour in, or received cream deliveries in. I finally found what I was looking for, and it makes me happy each time I take out a spoon to stir something I’m cooking. And yet, the wooden spoon, so gentle for stirring, the best way to ensure no harm will come to your non-stick pans, has another, darker connotation for me. “Who would take a picture of her mother throwing out trash?” asks Joyce Maynard, the writer. Maynard is running a memoir class on the Amalfi Coast of Italy. In my diary the class is dated Monday, July 18, 2011. The group is looking at a black and white photograph taken in 1982 of my mother throwing out the trash. Her back was to the camera when I took the picture. Prior to arriving in Italy, we had been asked to bring a picture from our lives. To do this, I had climbed over five boxes of children’s art, six dining room chairs and a mattress in our basement storage room under the back garden to retrieve the box of photos I keep, the ones that don’t go in albums or frames. I don’t throw these ‘reject’ pictures out, because I always hope one day to understand why I took them. The picture in front of the class was one of those.